It's a great time to be studying journalism in Washington, DC! American University School of Communication’s Media Innovation Lab was transformed into a newsroom for 48 hours of live election coverage last week. Graduate students from the COMM 621 - Online News Production course, as well as undergraduates from other classes, teamed up to cover Election Day and the fallout the day after. All stories produced by students, whether text or multimedia content, has been published on www.beltwaynews.org, a creation of the journalism graduates, with photos, stories, videos and additional vignettes filed from an undergrad reporting class working in teams. 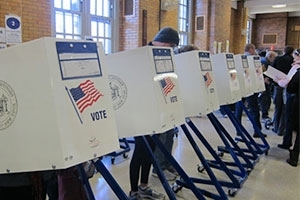 Students were sent out to polling stations in Washington, DC, Northern Virginia, Maryland and the White House early in the morning on Election Day to conduct interviews with voters and tourists. Meanwhile, some students remained back in the MIL working as producers and editors to make sure their reporters turned in their stories according to the deadline. Some students work with professional news organizations, including USA TODAY, NBC4, The Washington Post and WTOP. “We had 47 students traversing Tuesday across the District, Maryland and Virginia - by bus, car, Metro and on foot - to polling places to talk to voters, take stock of lines, turnout and problems,” said Lynne Perri, journalism professor at AU. Perri and Amy Eisman, also journalism professor at AU, took the lead in arranging the professional partnerships. Graduate students received contributing lines and bylines on the stories published by these media organizations. AU SOC has developed similar partnerships every election since 2008, and this year the demand for AU students increased. Faculty, including Jeremiah Patterson, Andrew Lih, Amy Eisman, Jill Olmsted, Lynne Perri, Chris Lawrence and Rose Ann Robertson, managed and oversaw students work from early morning to late night shifts. Coverage continued all day Wednesday after Election Day, where most students worked on election results reaction. Taylor Hartz, Josephine Peterson and Shaun Courtney: Washington Post, "Long lines reported across D.C. region as area voters decide, Clinton or Trump"
Teaganne Finn, Sara Wise, Natalie Hutchinson and Amaya Turner: NBC-4 Washington, "Polls Close in DC, Maryland, Virginia"
Natalie Hutchinson: NBC-4 Washington, "#WhyIVoted"
Mandy McLaren (byline), Matt Hanan, Jerrel Floyd and Patricia Torres (contributed): USA Today, "For many voters, election's end brings relief"
Jerrel Floyd and Patricia Torres: USA Today, "America voting: long lines, glitches, patience, thankfulness"